More than 15,000 people died that day. Hundreds of thousands who survived had no home to go to once the waters receded. For months, they lived in evacuation shelters like schools gymnasiums. Volunteers also cleaned the small family-owned factory of Futoshi Honda. The area’s economy is heavily dependent on catching and processing seafood, but the tsunami carried off rafts with special lures that are used to gather oysters and seaweed. So when the leader of an oyster farmers’ group approached Caritas asking for assistance, volunteers helped fishermen make more rafts. The government, along with volunteers from Caritas and other charities, has accomplished an enormous amount. 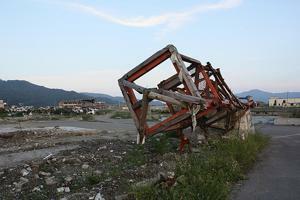 But six months after the tsunami, almost 83,000 people still cannot return home. For those living in government-built temporary shelters, Caritas volunteers are a familiar sight. The volunteers load small pickup trucks with food, diapers, towels and more, driving to the new lots and setting up stations. Caritas cooks hot food for the residents, encouraging them to mingle at the barbecues and get to know their neighbours. Before winter falls, Caritas will distribute items like jackets, blankets and heaters. It will also repair damaged schools, with plans to help over 3,500 students have a better place to learn. It will renovate an elder care facility and continue home visits. It will bring food to thousands of people via a mobile kitchen.